Christ became a figure standing alive before his cross, with arms open wide and open eyes. It was a conscious decision, as Rik Van Schil did not want to over-exalt the suffering and death of Christ as many of his predecessors did. By putting the emphasis too strongly and especially too exclusively on his suffering, we frequently bypass the essence of the meaning of Christ’s death on the cross. This ultimate meaning of Christ’s death is what the artist wants to portray in his work: Christ’s passion is completed only with his resurrection. That’s why he is not hanging on his cross. He is suspended before it, no longer attached to it, as if he is already rising from the dead. In this way the artist takes a step further than the early Romanesque sculptors, who also rendered Christ alive and unbroken, but at the same time kept him nailed to the cross. The style of Rik Van Schil matured through time. His work evolved from an abstract style to one that is akin to early Romanesque art, a form of art that once gave birth to extremely serene and expressive crucifixes. The artist has empathized so intensely and deeply with this image of the cross, he has spoken so intimately with it, that it may well have become his strongest work. What’s more, it may also be one of the strongest sculptures made in Flanders in recent decades. Enhanced through artistic quality the message Van Schil wants to convey comes through in an exceptionally powerful way. The Christ in Malle brings to expression – in crescendo – the living, crucified and risen Lord! 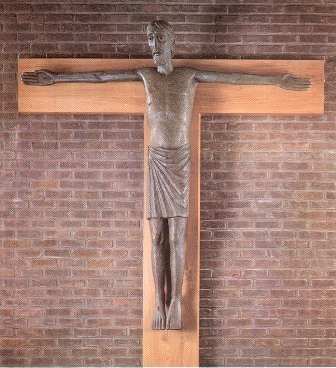 This meditation is a shortened and adapted version of the discussion of this crucifix on the website of the Sint Pauluskerk in Malle, Belgium (www.stpaulus-mallezoersel.be). For this article Ilse Van Halst interviewed art historian Lowie Weynants and based her text on the interview. Rik Van Schil: Kruis-Lieve-Heer (Cross of the Lord of Love), 2005, Sint Pauluskerk, Westmalle, Belgium. The FranciscanRik Van Schil, OFM followed his training as sculptor at the art academies in Antwerp, Croatia and Carrara (Italy). He works in bronze, marble and wood. He has had many exhibitions in various countries. Together with Geroen De Bruycker he was instrumental in founding the art centre ‘Pro Arte Christiana’ in Vaalbeek, Belgium in 1957 which wanted to renew churches and the visual arts in the spirit of Vatican II. The centre still organizes regular conferences. Ilse Van Halst is a journalist and writer who works for the journal Kerk en Leven. She has published two books. Lowie Weynants (1930) studied art history at the Katholieke Universiteit Leuven and has worked as a radio producer. He has written several books in the area of Christianity and the visual arts, among others about Rik van Schil (Cera Bank – Brussel, 1996) and Geroen De Bruycker (Sinfra –Reusel, 1969).